This article is about the room found in Luigi's Mansion. For the special area of the same name that appears in Super Mario 64 DS, see Rec Room (Super Mario 64 DS). 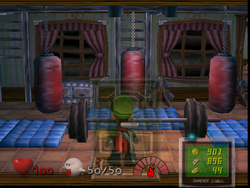 The Rec Room in the Nintendo 3DS remake. 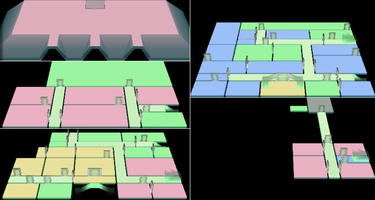 The Rec Room is one of the many rooms from Luigi's Mansion. It is located in the third area. When Luigi enters the Rec Room, he sees the ghostly bodybuilder Biff Atlas working out. Luigi can simply ignore Biff or fight him for more treasure. The Rec Room is filled with exercise equipment such as a treadmill, weights, punching bags, and several other fitness machines. If Luigi runs on the treadmill for a bit, it spits out a key which can be used to unlock a door connecting the third area and second area. A Speedy Spirit is hiding in the fitness machine with the ladder attached to it. This page was last edited on September 19, 2018, at 21:32.